Every position has two basic elements: balance of power and balance of territory. Each stone has a direction. Stones develop in efficiency in the following order: corner, side, center. Stones need room to develop. From the moment you play your first stone, you should have a plan in mind. A goal you wish to accomplish. If you play in a club, you typically play the same people over and over. After a while you get an idea of how they like to play. Territory-oriented, fighting-oriented, calm ... . At the same time you know how you like to play. A basic plan would be to have the game develop to the point where it is the kind you like to play, and away from the kind that your opponent likes to play. For example, you like to play a territory game. This means that in general your first move in a corner should not be 5-4, as this move eschews territory the most. Or if you like to play a center oriented game you should not play 3-3 as the first corner move, as it emphasises the corner but puts little emphasis on the center. As the game evolves your plan should change to fit the new circumstances on the board. Unless a player has made a major blunder, it is unlikely that either player clearly leads in both elements. Even minor blunders have some redeeming value, so they do not upset the balance of the game (much). The fuseki is the place where you determine how those two balances are distributed. Power, as I use it here, is made up of various aspects of go: thickness (good for local fighting), influence (good for fighting on a larger scale), aji (your opponent's bad aji is good for you in a fight of any kind), etc... . There are five fundamental corner plays: 3-4, 3-5, 4-5, 4-4, 3-3. Direction of play of corner stones. The 3-4 stone (at a) has as its principal direction of the t,v direction. This is the direction played to settle the corner. Ideal followups for it are r,s,t,v. A secondary direction of play for it is x and y. This is the direction where the most development takes place after the corner is settled. It also has a tertiary direction, down the left side. A position where one side gets 3-4 and all three directions is called a double wing. If you let your opponents make many double wing formations, I suggest you give up go for tiddlywinks. The 3-5 (b) and 4-5 (c) stones' principal directions are x and y, with some influence in the corner. 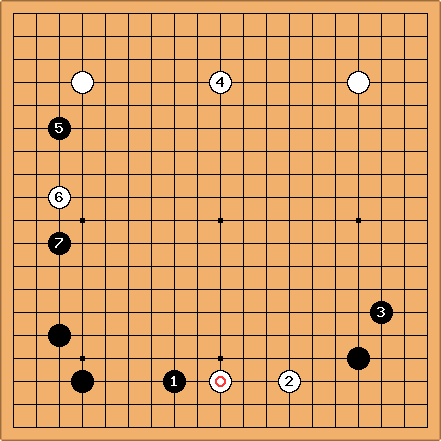 The 3-3 (e) stone has its direction all focus into the corner, it has virtually no influence on the rest of the board.The 4-4 (d) stone has its direction focused mainly towards the center, it has virtually no influence on the corner or the sides. 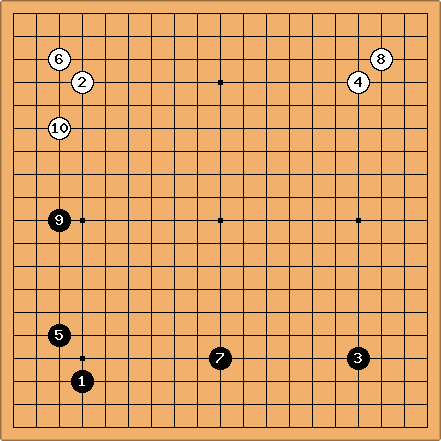 However often extensions are made from a 4-4 which have their own directions of play. This rule does not mean that it is better to play first in the corner, then the sides, then the center. The question of where it is better to play first is hotly debated by almost all players. A smart person considers that topic to be in the same class as religion and politics: best avoided in discussions. What is meant is that the stones are more efficiently settled in the preceding order. For example, a stone played at 3-3 or 4-4 does not need a follow up until the opponent approaches the stone. It is settled the moment it is put down. ( A 3-4,3-5,4-5 stone needs at least one other stone to settle it.) A 4-4 stone announces "I don't want the corner, I want power radiating towards the center." During the game the opponent can take the corner. At some point though, the original player announces "I gave you a chance to take the corner, you don't want it. So I will take it" by playing 3-3,3-4,or 2-4. A stone on the side generally needs at least one follow up stone, and that is generally not enough to settle the group. often a third and a fourth stone are needed. It is a general heuristic that a group in the center needs to occupy a region of about 20 points before it is alive. This takes at least three moves, and often many more. In example 1, 1 is approached from both sides, so has no room to expand or breathe. This stone may become a liability. In example 2, 1 manages to make a one space extension. It has room to breathe but not much. In example 3 1 makes a 2 space extension it has a good amount of room to breathe. Observe that in example 2, no matter what black did white could make the extension. 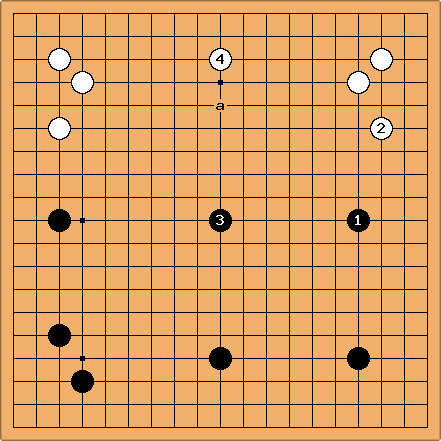 Also observe that in example 3 black could not stop white from making a two point extension. That the stone in example 1 has no room to breathe does not mean that it will die. What it does mean is that it is very likely to make an extremely weak group that will be attacked in the middle game. By the same measure the limited space that stones in example 2 have mean that they are likely to make a weak group. The stones in example 3 are not likely to make a weak group. The next rule is develop quickly. One term often used in discussing positions is overconcentrated. This means that you have played stones too close together and have not gotten maximum effectiveness from the stones. It is a form of not developing quickly, another example can be seen in this diagram. Example of good and bad development. In this example, it should be clear that Black is way ahead. The black stones are spread out over a much larger area, and they are evenly developed. White, on the other hand, chose to focus on strongly defending the two upper corners and the top. Despite this the top is still invadable ( probably beginning with the capping move at a ). In the same vein you want to spread out your stones as much as is possible while still having them work together. I know that figuring out when stones work together is hard, but at the very least you can figure out when stones very badly don't work together and avoid that. As you learn shape working together will become more intuitive. This might be the sequence played out after Black responds to K3. Would you be happy playing this game? If not then don't play 1, Of course this is generally harder to do than local reading, but absolutely necessary if you want to come out of the fuseki with an advantage. We have already said it is important to have a plan in the opening, and that same Plan may evolve. However we have to be careful with its evolution. If our plays are not consistent then we will find many of our moves can turn out to be wasted. Consider the example below. The marked stone cannot be said to be most efficient here, perhaps at a or b it would be more use. Black's SanRenSei in basic terms is aiming at making a moyo on the right hand side. By splitting and making a territory at the top he ruined his right side, yes he took territory elsewhere in compensation, but he wasted an earlier move. DrStraw: The above suggestions all apply primarily to making your own moves. You should also go through the check list after each of your opponent's moves. If you detect any inconsistency then you should try to find a way to take advantage of it. For example, if your opponent's last play violates the "Stones need room to develop" premise then identify the exact nature of the error and try to find a line of play which takes advantage of it and maintains that advantage. Do not give the opponent a chance to recover from the error, which is what may happen either if you are unaware of it or if you do not punish it. In this case there are two considerations: find a way to attack the stone in a manner consistent with the premises on this page - this you would do if you felt you had enough strength nearby to make territory while attaching (note that you would not be trying to kill); do not lose the advantage by repeating the error yourself. This is one area of the game where it is very hard to study from professional games because they do not make these errors as often, or if they do, then they are not as obvious. So all you can do is watch the game of people a little stronger than yourself and try to identify their errors and find a way to take advantage.